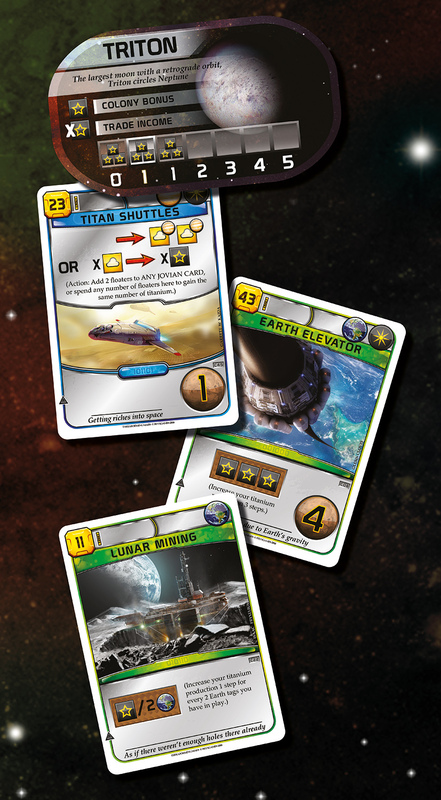 With a focus on trade and colonization of small worlds throughout the solar system, the Colonies expansion for Terraforming Mars naturally features some titanium-producing cards. Not only can titanium be used for lauching your trade fleet, it is also highly useful for building all space infrastructure. Triton is therefore sure to get attention when in play. Trade with it before the competition takes the bounty – or establish a colony to leech off of them even when they beat you to it! Titanium can also be found on Saturn’s moon Titan, where your shuttles can lift it into orbit, or deliver it to various atmospheric projects. But you don’t have to go that far though to find titanium. Suitable ship-building materials are found right here on Earth, but are just too expensive to get into orbit in larger quantities. Building a Space Elevator on Earth might change that, and even though some consider the challenges too great, the rewards are more than worth it. The whole of humanity will thank you! Considerably cheaper, but less glorious, would be to mine the moon.